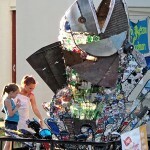 SEE SCRAPPY the RiverFest mascot on display throughout the RiverFest event! 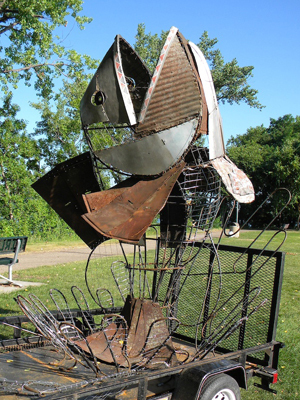 In 2013 Twin Cities sculptor, Mary Johnson, was commissioned through a private grant to create a river-themed sculpture for RiverFest. 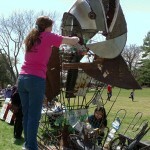 The metal armature for the splashing bass figure was constructed in her studio and mounted on a trailer for transport. 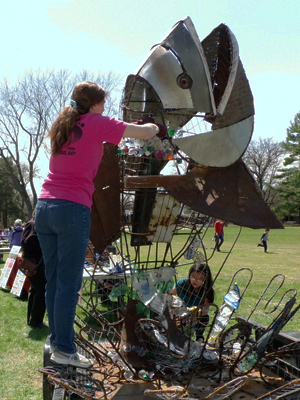 A contest to name the bass was held and the sculpture was named Scrappy. 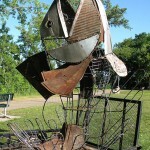 Scrappy’s permanent home is at Camp St. Croix, however, he makes several appearances at local events and attends area parades. 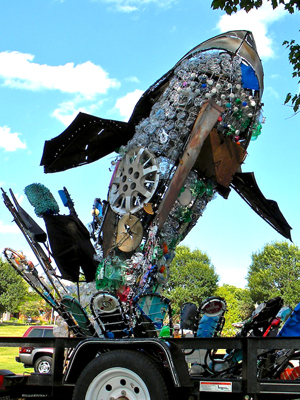 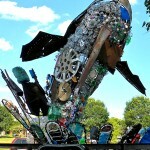 Each year students from the Phipps Center for the Arts’ “Just Add Water” art and science class help complete the sculpture by processing and repurposing the litter collected in Hudson during the river cleanup to create a new “skin” for Scrappy. 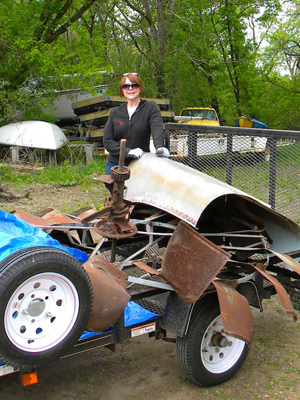 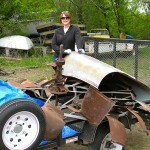 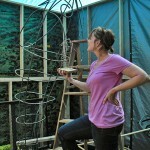 Twin Cities sculptor, Mary Johnson selects metal parts from Camp St. Croix to use for the commissioned sculpture. 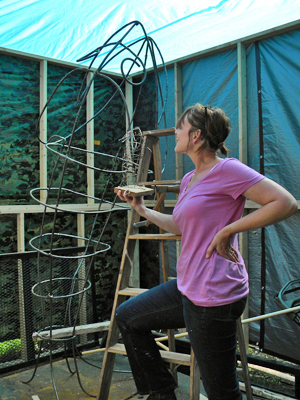 Artist Mary Johnson poses with a modle of the splashing bass sculpture. 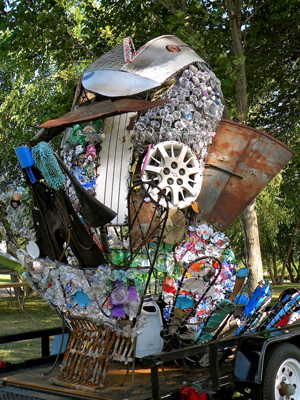 The splashing bass sculpture is named Scrappy and is ready for the trash collected during the river clean-up to be attached. 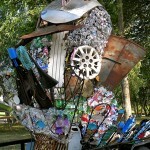 Scrappy’s “skin” shows some of the many items collected during the river clean-up. 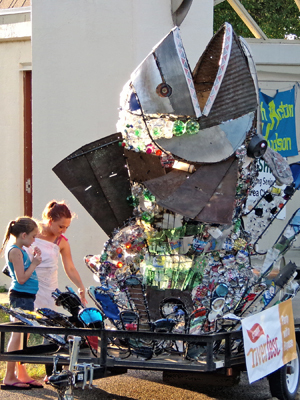 Scrappy on display at the Thursday RiverFest Concert. 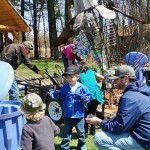 It is time for Scrappy to shed his “skin.” Volunteers remove and recycle the trash at the Earth Day event at Camp St. Croix. 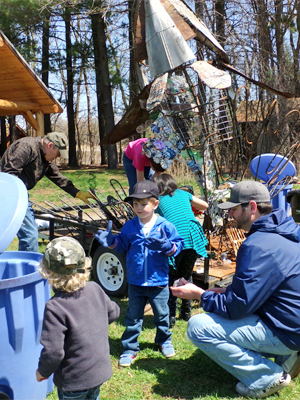 Young helpers help sort and recycle Scrappy’s trash so he is ready for a new “skin” of trash attached during the 2014 RiverFest.